Today we’re introducing several updates to Google Earth Timelapse, a global, zoomable time-lapse video that lets anyone explore the last 35 years of our changing planet’s surface—from the global scale to the local scale. This update adds two additional years of imagery to the time-series visualization, now spanning from 1984 to 2018, along with mobile support and visual upgrades to make exploring more accessible and intuitive. Timelapse provides a comprehensive picture of our changing Earth—including stunning phenomena like the sprouting of Dubai’s Palm Islands, the retreat of Alaska’s Columbia Glacier and the impressive urban expansion of Las Vegas, Nevada (seen below). See the growth of cities around the world, including Las Vegas, Nevada. See the impact of large-scale infrastructure on a local level such as hydropower dams in the Brazilian Amazon. 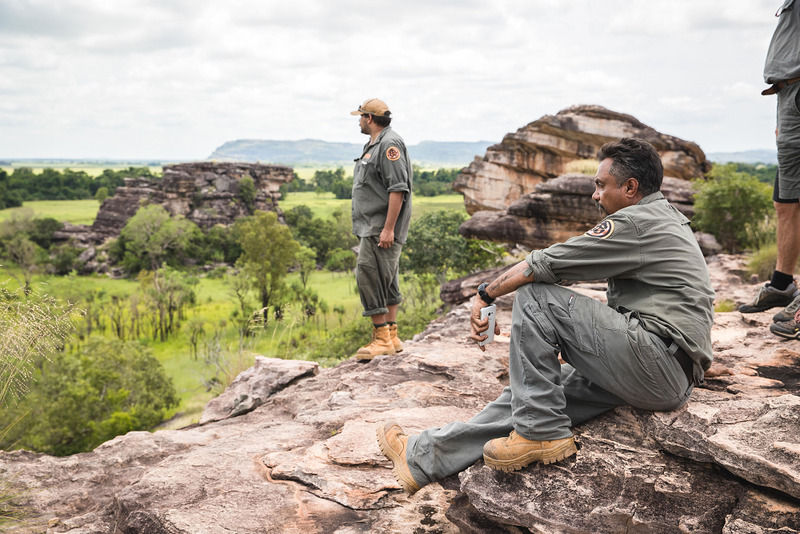 Gaze in awe at the scale of change, sometimes rapid, like bushfires in Australia's Northern Territory. See the complex dynamics of many different things at play in a small place like volcanoes, deforestation and wildfires. 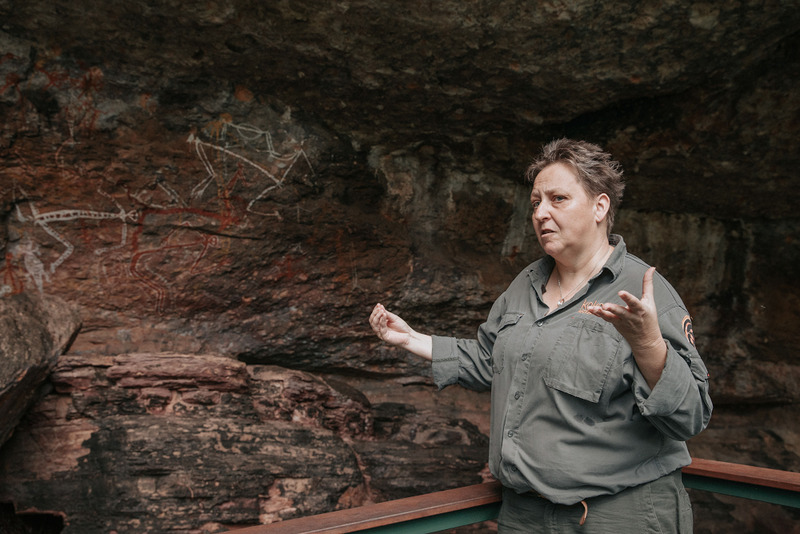 Explore patterns of human activity, like surface mining, which takes many diverse forms across the world. Scientists, documentarians and journalists have used this dataset to help us better understand the complex dynamics at work on our planet. News outlets have brought their reporting to life with Timelapse imagery, from coverage of the floods in Houston, Texas to population monitoring. Recently, a team of scientists at the University of Ottawa published an article Nature based on the Timelapse dataset which revealed a 6,000 percent increase in landslides on a Canadian Arctic island since 1984. Starting this week, if you’re in the U.K., you can see Timelapse imagery featured in Earth From Space, a new BBC series about the incredible discoveries and perspectives captured from above. Zeit Online uses Timelapse to show the extent to which jungles are cleared for soy production in Brazil. 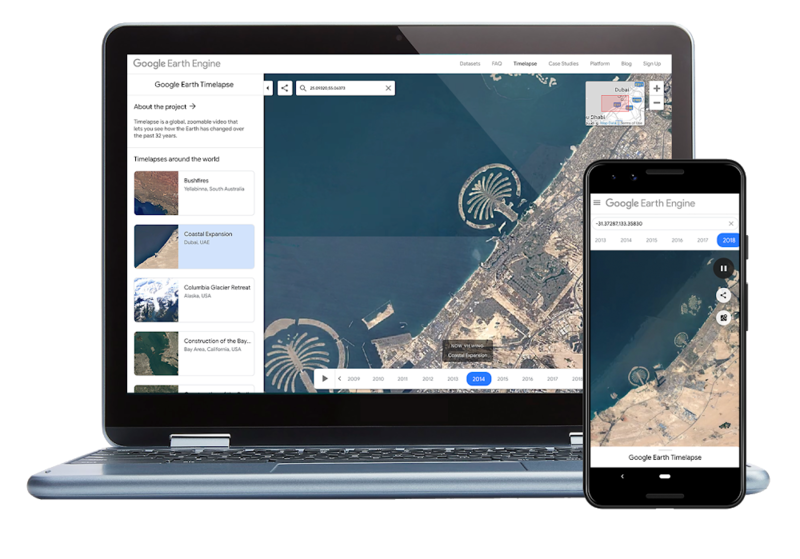 Using Google Earth Engine, Google's cloud platform for petabyte-scale geospatial analysis, we combined more than 15 million satellite images (roughly 10 quadrillion pixels) to create the 35 global cloud-free images that make up Timelapse. These images come from the U.S. Geological Survey/NASA Landsat and European Sentinel programs. Once again, we joined forces with our friends at Carnegie Mellon’s CREATE Lab, whose Time Machine video technology makes Timelapse interactively explorable. Today's update also adds mobile and tablet support, making it a little easier for you to explore, research or get lost in the imagery—from wherever you are. Up until recently, mobile browsers disabled the ability to autoplay videos, which is critical for Timelapse (since it’s made up of tens of millions of multi-resolution, overlapping videos). Chrome and Firefox reinstated support for autoplay (with sound muted), so we’ve added mobile support with this latest update. Earth Timelapse, now available on phones and tablets, includes a handy new "Maps Mode" toggle to let you navigate the map using Google Maps. The design of the new Timelapse interface leverages Material Design with simple, clean lines and clear focal areas, so you can easily navigate the immense dataset. We contributed this new user interface to the open-source Time Machine project, used by Carnegie Mellon and others. Read more about our design approach at Google Design. We’re committed to creating products like Timelapse with the planet in mind, and hope that making this data easily accessible will ground debates, encourage discovery, and inform the global community’s thinking about how we live on our planet. Get started with Timelapse on the Earth Engine website, or take a mesmerizing tour of the world through YouTube. 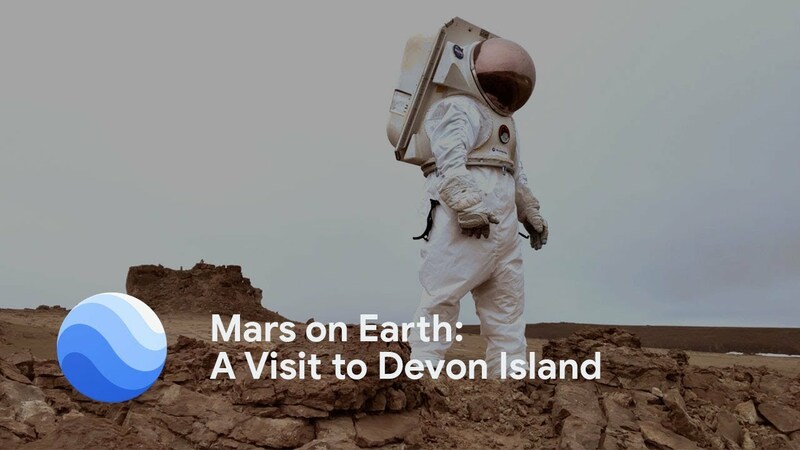 This entry was posted in Official Google Blog and tagged Google Earth, Maps, Sustainability on April 25, 2019 by The Official Google Blog. Starting today, you can see the real time availability of charging ports in the U.S. and U.K, right from Google Maps–so you can know if chargers are available before you head to a station. Simply search for “ev charging stations” to see up to date information from networks like Chargemaster, EVgo, SemaConnect and soon, Chargepoint. You’ll then see how many ports are currently available, along with other helpful details, like the business where the station is located, port types and charging speeds. You’ll also see information about the station from other drivers, including photos, ratings, reviews and questions. You can search for real time EV charging information on Google Maps on desktop, Android, iOS and on Google Maps for Android Auto. To get started, update your Google Maps app from the App Store or Play Store. 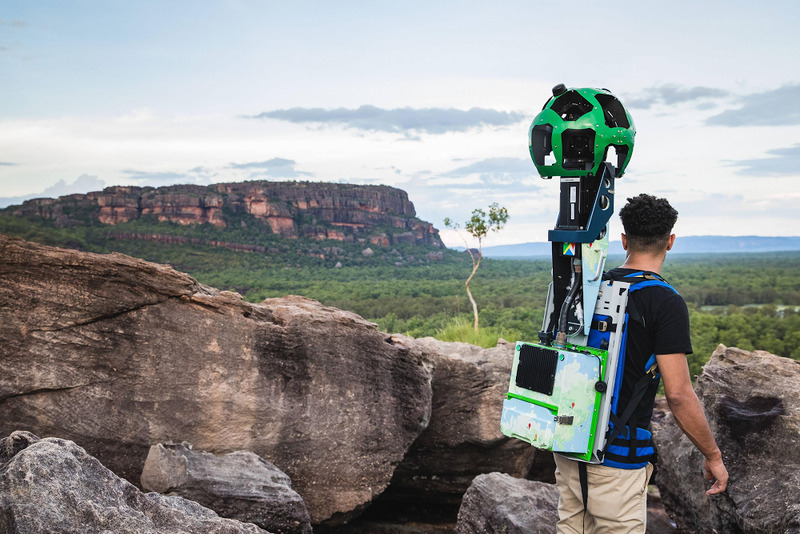 This entry was posted in Official Google Blog and tagged Maps, Sustainability on April 23, 2019 by The Official Google Blog. Google Maps shows you how to get around on foot, car, train and bicycle, and now, you can ssslither to your destination too. Starting today, you can play a twist on the snake game in different locations across the world—including Cairo, London, San Francisco, São Paulo, Sydney and Tokyo–right from Google Maps. To start playing, simply open the Google Maps app, tap on the menu icon on the top left corner, then select "Play Snake" to get your daily dose of 90s nostalgia (boy bands, fanny packs and slap bracelets not included). Once you’ve selected a city, start picking up as many passengers as you can as your train travels around the world—stopping everywhere from Big Ben, the Great Sphinx of Giza to the Eiffel Tower. But make sure you don’t run off the map (or into yourself)! Snake on Google Maps starts rolling out worldwide on Android and iOS today, and will be live in the app for about a week. Anticipating a snake addiction? Us, too. Head over to our standalone site to keep playing, long after April Foolsss is over. This entry was posted in Official Google Blog and tagged Maps on March 31, 2019 by The Official Google Blog. I took my first solo vacation in June 2017, and the experience changed my life. After countless searches of Norway’s beautiful landscapes on Google Images, I decided to make the trip there all by myself. The following year, I took my second solo trip, this time to New Zealand. After that, I knew I didn’t want to wait until my retirement to travel—I wanted to do this full-time. So I decided to quit my job this past June, exactly one year after my first solo trip, to make travel my career. It was one of the best decisions I have ever made. My post-corporate journey has been nothing short of thrilling. I toured Europe for 58 days, visiting 15 countries while making a living as a social media and branding consultant. Even though the experience has not always been easy (I got my phone stolen in Paris, for one), I’ve kept going, attending conferences and seeing the most scenic islands in the world. On my first solo trip, I became a Local Guide on Google Maps, writing reviews of restaurants in Norway from the perspective of a solo female traveler—and one who kept a strict vegetarian diet. Throughout my travels, I continued adding photos and reviews about my experiences and reached Level 8 out of 10 in the Local Guides program. I wrote a post on Local Guides Connect sharing what I learned from various trips, and used the Local Guides Connect forum to ask for suggestions on places to visit. I even made a ton of friends from the program along the way through, thanks to taking part in conversations on the forum. My fellow Local Guides have helped me check out national parks to visit in Italy and places to visit in Portland, Oregon. And this past October, I was one of 151 Local Guides selected to attend the Connect Live 2018 conference in San Francisco. Throughout my time as a full-time traveler, and as a Local Guide, I’ve picked up some tips on how to experience the world, even when you’re alone. Here’s my advice on how to plan a successful solo trip, with help from Google. 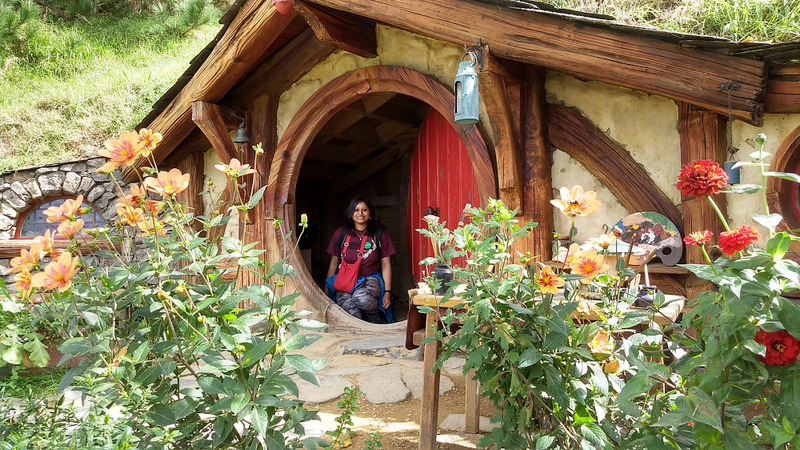 Visiting Hobbit houses in New Zealand. 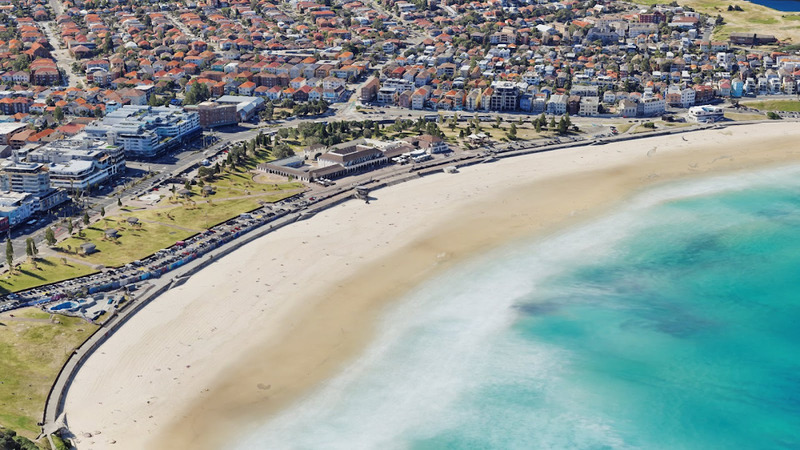 Start off by creating a list on Google Maps of all the places you want to visit. Once you have your destination in mind, use the Google Trips app to plan your travel and organize your itinerary. And if you want specific recommendations while you’re there, check out the Local Guides Connect forum. One of the best parts of my Europe solo trip was meeting a Local Guides Connect moderator, Ermes. I was in Venice and had messaged him the previous day about my travel. In spite of the short notice, he drove down and met me! I got a Local Guide to show me around Venice, and it was so helpful and memorable. If you can’t get a Local Guide to be your personal advisor, try signing up for organized tours. You can relax and enjoy the scenery as a tour guide shares stories of local places, and navigates you through a new city. Save money wherever you can. If you use a travel agent, have them get you itineraries, but plan and book the places yourself to save some cash. Use public transportation wherever possible, and try staying at a hostel for a cheaper stay that lets you meet, mingle and share your travel experiences with other visitors. And if you need to apply for a visa, do it yourself, so you have more money for that kayaking trip of yours. Taking in the sights in Paris. Make the most of the daylight by waking up early and visiting places you want to see in the first part of the day. And ask someone at your hotel, hostel or vacation rental whether it is safe to walk in your neighborhood at night, or use public transportation after dark. And use the Google Translate app when you are in a foreign country and don’t understand the language. Keep an eye on what’s next. The most rewarding part of solo travel is the luxury of designing your own itinerary and seeing your travel plans come to life. For me, the next place I hope to visit is Banff, Canada, and I’ll bring my knowledge as a solo traveler (and Local Guide) along for the ride. This entry was posted in Official Google Blog and tagged Maps on March 8, 2019 by The Official Google Blog. Starting this week, you can see nearby Lime scooters, pedal bikes and e-bikes right from the transit tab on Google Maps in over 80 new cities around the world. 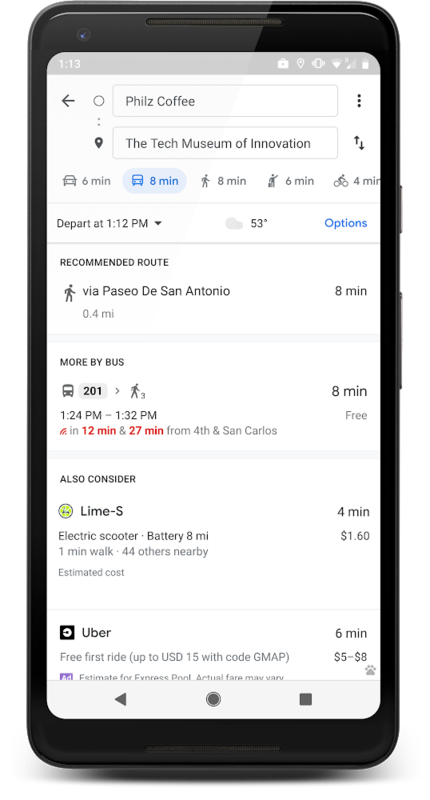 When you need to travel short distances or that last mile, Google Maps can tell you if a Lime vehicle is available, how long it’ll take to walk to the vehicle, an estimate of how much your ride could cost, along with your total journey time and ETA. Arizona (Mesa, Scottsdale), Arkansas (Little Rock), California (Monterey, Mountain View, San Marcos, Santa Barbara), Colorado (Denver), Florida (Miami, Orlando), Georgia (Atlanta, Statesboro), Idaho (Boise), Indiana (Bloomington, South Bend), Kentucky (Louisville), Massachusetts (Arlington, Bedford, Belmont, Chelsea, Everett, Malden, Medford, Melrose, Milton, Needham, Newton, Revere, Waltham, Watertown, Winthrop), Michigan (Lansing), Nevada (Reno), Missouri (St. Louis), New Jersey (Keyport, Metuchen, Plainsfield), New York (Ithaca, Queens, Rockaways), North Carolina (Charlotte, Charlottesville, Greensboro, Greenville, Jacksonville, Raleigh/Durham), Ohio (Columbus, Oxford), Oklahoma (Oklahoma City, Tulsa), Rhode Island (Providence), Tennessee (Memphis, Nashville), Texas (Corpus Christi, Lubbock), Utah (Salt Lake City), Virginia (Harrisonburg), Washington (Tacoma), Washington DC. The next time you need to get around town, check out Lime—right from Google Maps. This entry was posted in Official Google Blog and tagged Maps on March 3, 2019 by The Official Google Blog.